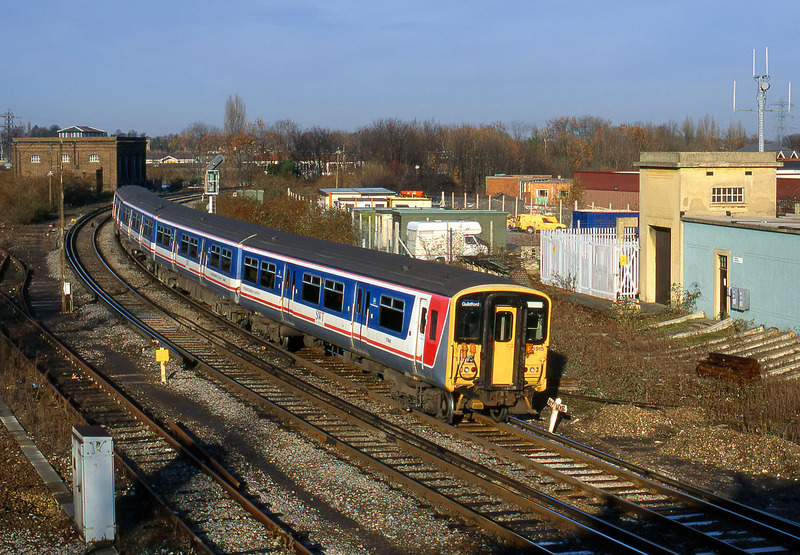 Class 455 5915 arrives at Guildford on 14 December 1996 with the 12:14 Waterloo to Guildford Network SouthEast service. It is rounding the sharp curve from the Effingham Junction direction, which here meets up with two other lines (from Woking and Farnborough). This line diverged from the main West of England line at Hampton Court Junction, and offers an alternative route than via Woking. Note the steam age gradient post that the unit is about to pass, showing the end of a 1 in 307 downgrade and the start of a level section.